Casa Abhayaa está idealmente ubicada en el Centro Histórico de Mérida, a menos de un minuto a pie de la hermosa iglesia del siglo XVII, La Ermita de Santa Isabel, ya solo cinco minutos de San Sebastián, otra de las fabulosas iglesias de Mérida. La casa es conveniente para la plaza central de Mérida, el aeropuerto y todas las autopistas. Casa Abhayaa es una cómoda casa de 2 dormitorios y 2 baños con techos altos, puertas con arcos elegantes y mucha luz. Su construcción y mobiliario emplean con buen gusto materiales coloniales tradicionales como hierro forjado, azulejos de pasta de hormigón, pisos de concreto pulido y madera. 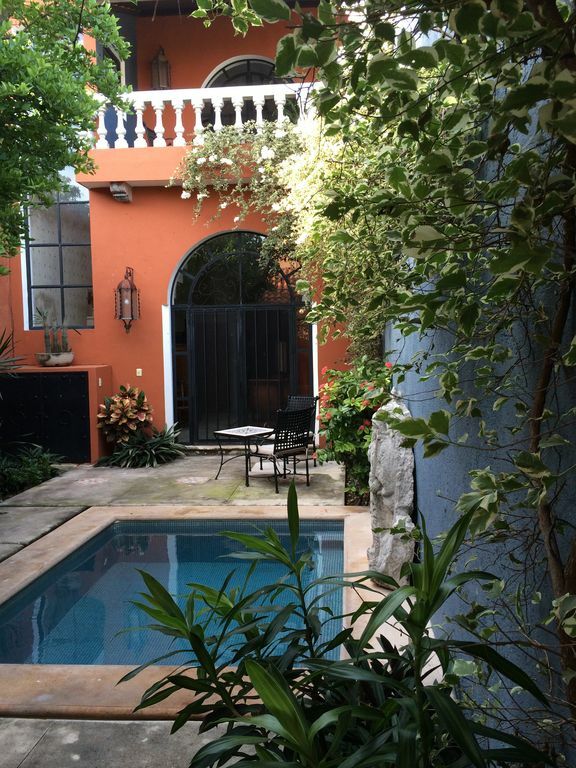 La sala de estar se abre a un encantador patio privado con piscina, y áreas para comer y descansar, rodeado de plantas y árboles frutales. La espaciosa cocina contiene todos los electrodomésticos modernos e incorpora una gran mesa de comedor para seis personas. El dormitorio de invitados con dos camas individuales y un baño completo completan el nivel inferior. Todo el nivel superior está dedicado al suntuoso dormitorio principal, que incluye una cama tamaño king, un gran armario personalizado, escritorio, baño completo, balcón con vistas al patio y una generosa terraza en la azotea, cócteles frescos por la noche o tomar el sol durante el día. Casa Abhayaa está equipada con Internet de alta velocidad, WiFi, televisión por cable, sistema de audio para CD / iPod / iPhone / FM / AM, aire acondicionado en las habitaciones y un sistema de agua presurizada, ablandada y purificada. Desafortunadamente, Casa Abhayaa no es apta para niños menores de 12 años. Andy was extremely patient and helpful throughout our arrival and during our stay. She was very thoughtful in explaining the area, house, and what we should do while in Merida. The home was very nicely decorated and outfitted well. It was hot during our visit, but the ceiling fans and A/C in the bedroom made it quite comfortable. The outside pool was nice to cool off if needed too. There are 2 large balconies and the outside patio so a lot of space to sit, relax, or have a drink. The neighborhood is quiet and close enough to walk to the Centro/markets, it was also easy to take a taxi a couple times for 40 pesos. We had a rental car, but didn't use it much while staying here. There is lots of street parking and very safe. Overall it is a great place as it's a true vacation rental since it is a really relaxing place to take it easy and enjoy the property, or explore the area and know you have a nice place to come home to at the end of the day. Wish we had more time to enjoy it. Casa Abhayaa is perfectly located. Walking distance from everything. The courtyard is enchanting. The house itself is tastefully decorated and well appointed. It is the perfect place to retreat and recharge. This was the perfect spot for our party of 3...cool, comfortable and great for entertaining... we walked most places and cabs were plentiful...the manager was excellent and facilitated everything from a local chef to a car with tour guide... I would highly recommend this rental! Both the amenities and the aesthetics of this house are exactly as described, and perfect for our group of 3 adults. It's private, cool, calm, and very comfortable!! The local manager is a great resource, immediately responsive on even the smallest question. Highly recommended! We thoroughly enjoyed our stay at Casa Abhayaa. The home's high ceilings, cool colors, and spare decor invite feelings of tranquility and reflection. The spacious kitchen is great for preparing and eating meals. The attractive living room opens onto a patio oasis of tropical vegetation (in fact, lemons from the tree out back went into our margaritas!). A small sitting pool and lawn chairs invite you to outdoor time. I really love the open stairs that ascend to the master bedroom, with a very comfortable bed and open-air patios on either side. The shower is a gem of design -- standing on the bathing stone, looking at the sky through the window, I felt happily spoiled. Calle 77 is busy and noisy but after a night we got used to the city sounds. We were delighted two mornings to hear a wandering trumpeter work his way down the street. From Casa Abhayaa it's about a mile to the central cathedral and plaza -- an easy walk (taxis are plentiful as well). Merida is a cultural gem, a vibrant city surrounded by historical treasures. We enjoyed our trip in large part because we had a nice home to go to. My niece and I spent a magical week in La Ermita just before Christmas, 2014. We are walkers, so its central location for exploring the parks of Mérida, and shopping at the markets during the day was perfect. Wandering randomly after dinner in Centro to enjoy the holiday lights on people's homes was charming and we always found new routes home, since La Ermita is a center of activity. Breakfast we purchased from the ladies at the breadshop on the corner, on the mornings we didn't enjoy fruit from the market in the garden. There was always a fresh lime or orange on the trees to squeeze on the papaya. A small corner store supplemented anything we might have forgotten, or that Andrea had not provided for us on arrival. Two doors down towards San Sebastian a friendly couple supplied ice-cold beers from their front room for watching the sun set from the roof. Previous guests have observed that the internet connection was intermittent. We found that also, but that for our few e-mail needs, late evening to early morning was always reliable. I should add, that even in the medium-sized Texas town where I use the internet for work, there are frustrations with service! The furniture was perfectly comfortable for our needs - mostly sitting at the ample kitchen table or on the patio. We never even thought to turn the television on, so can't comment on the adequacy of the sitting room. As far as cleanliness is concerned, we took our cue from our neighbors - they sweep their houses every morning, and clean up leaf litter daily as well. Unless a daily concierge service is part of the rental package, this is part of the ritual of living in the urban tropics with the windows and doors open. I swept daily when I lived in Panamá several years ago - it doesn't take long and is quite soothing. We probably won't be staying in Casa Abhayaa again, because Andrea is putting the finishing touches to our house, very similar in conception, a few blocks away. But we will always pass it with feelings of affection, and call in at the church before catching a cab in the square and embarking on a journey. Mérida es una ciudad especial en el corazón de Yucatán maya. Las playas, los cenotes (grandes cisternas naturales de agua dulce) y los antiguos sitios arqueológicos mayas se encuentran a poca distancia en automóvil. Mérida ofrece excelentes tiendas, actividades culturales, deportes y una amplia gama de otras actividades. Consulte los muchos recursos en línea para eventos y actividades. Puedes estar muy ocupado o muy tranquilo y pacífico aquí.